I dropped my BB Bold in late december and started to use a new HTC Desire HD in january. 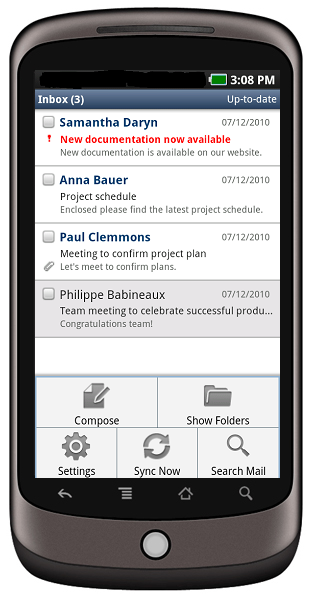 My Bold served as a mobile mail and calendar client primarily and I didn’t use it to surf the web or install apps on it. So seeing all those iPhones and Android Smartphones out there with so many more capabilities than my Bold I definitely wanted one too. I am no Apple fan and haven’t had any Apple device at all so my choice was Android. I checked the market and finally went with the Desire HD. The BB Torch was on my list for a couple of minutes but I reckon Android the better and more flexible system. Writing texts on my Bold was quick and easy and when you are used to that you do not want to step back and go for the worse. So I was sceptical about the touch keyboard but I must say, it’s almost as quick and easy to write on as it was on my Bold. I know this is nothing traveler handles but to me it’s one of the most important issues when using traveler. Adding recipients to mails or calendar entries is so easy. Just type names and you get a list of matches from your contacts. And here is the good news: It’s not only contacts from your LN N&A or your corporate directory, it’s also contacts from your Facebook, … accounts as long as you allow them to synchronise with your device. Calendar entries can be marked private. I heard that this was impossible with prior versions of Traveler, but it works like a charm with Traveler 8.5.2. This is an important feature to me since we use our own GroupCalendar solution that grabs all appointments from my personal calendar and I want to keep my private appointments private. Synchronisation does not work like it should. This might be an internal problem but it is annoying whatsoever. After a couple of days of smooth synchronisation it simply stops telling me that the server does not answer. The server log says that the device’s security settings are not allowed and synchronisation is therefore prohibited. Rebooting the server solves the problem. We now decided to reboot the server once a night. The signature does not allow CR/LF so you have to cope with a single lined signature. There is no way to configure a server-side signature for the devices either so this has to be improved as soon as possible. Are you using Traveler as well? What are your impressions? What do you think has to be improved / implemented soon? Lotus Script: Dead or Alive? Lotusphere 2011 is over and apart from „Get Social. Do Business“ Xpages was the main topic. IBM’s strategy is mobile and web with xpages as the underlying technology as far as Lotus Domino is concerned. You have all seen the demo (Hey, what time is it again? It’s demo time!) in the OGS showing Notes Next, right? The web browser took a huge part of the whole and Ron presented xpages mobile controls on his android device. So talking web and mobile which piece of the cake will Lotus Script get? What do you think? Any other opinions? Today my Blog got listed on PlanetLotus. I just want to say thank you Yancy! So who am I? I am a Lotus Geek living and working in Germany. I work for an IBM Premier Business Partner called We4IT which you may or may not have heard of. We actually attended LS11 and some of you might have got in touch. Anyway, I’ve been dedicated to the Lotus Brand for almost 15 years as a developer and consultant. You will be finding all kind of information on my blog as long as it is yellow. Hope you’ll like my postings and stay tuned. See you around. I provided a couple of links yesterday to XPages resources to get started with this excellent technology. Today I want to introduce a set of controls which allow to create mobile applications with XPages within hours (or even minutes): XPages Mobile Controls! Big thanks to OpenNTF, in this special case to Niklas Heidloff and Steve Castledine. Great work guys! You will find a couple of videos on the OpenNTF page for mobile controls. Here is one that provides a good overview of the capabilities of mobile controls. So this is an awesome add-on to XPages that every developer should be aware of. I downloaded the controls and will check them out next. You will find my first steps and the results on my blog in the next couple of days. So stay tuned!